A Supreme Court case challenging the protectionist booze licensing regulations in Tennessee is not expected to rule until June – and experts are warning it may not result in loosening interstate booze sales laws as hoped. The Tennessee Wine & Spirits Retailers Association v. Blair case, which was heard in the US Supreme Court last Wednesday (16 January) is challenging a state residency law in which anyone applying for an initial alcohol licence must have been a resident in Tennessee for two years and in order to renew that initial one-year license, must have been a resident in the state for ten consecutive years. It has been brought on behalf of mega booze retailer Total Wine Beer, Spirits & More, and lawyers acting for Doug and Mary Ketchum of Kimbrough Wine and Spirits, a couple who moved to Tennessee from Utah for the sake of their daughter’s health and bought an existing Memphis liquor store. They argue that the residency requirement is discriminatory and therefore unconstitutional. It is being backed by the National Association of Wine Retailers and others, including a group of 81 consumers who filed a brief in support. Many people hope that if the case strikes down the residency requirement, the case might open up the possibility of interstate wine sales across the US, something effectively banned since Prohibition was repealed in 1933 and the 21st Amendment was signed allowing states to regulate sales and shipment of booze. However Sean O’Leary of Chicago-based president of the O’Leary Law and Policy Group LLC, who attended the hearings, told Forbes.com that even he thought the residency requirements may be struck down, the case was likely to remain “narrow” and not challenge the nature of the three-tier system for alcohol sales. “This case will be a narrow decision and will probably not deal with [direct-to-consumer] DtC,” shipments, O’Leary told the news organisation. Total Wines’ lawyer allegedly refused the invitation to go towards a discussion of direct-to-consumer sales, saying the retailer’s long-term goal was to “not to be discriminated against”, rather than the “Amazon of liquor”, suggested by new supreme judge, Neil Gorsuch. 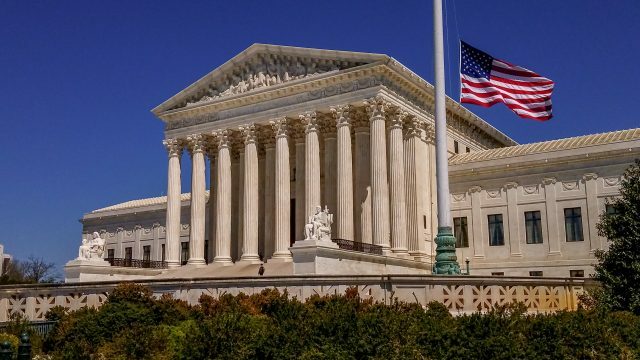 “My prediction is that justices who heard this case will fashion a decision that preserves a state’s ability to maintain the basic elements of a state-based, three-tier system while laying down the constitutionally sound principles prohibiting a state to pass protectionist laws that impede interstate commerce,” O’Leary told Forbes. The US’s complex liquor licenses were set up at the end of Prohibition, when the 21st Amendment ruled that each state make up its own laws on the sale and shipment of booze, and set up the three-tier alcohol distribution system. Currently 13 states in the US, permit interstate wine sales, comprising Alaska, California, Idaho, Louisiana, Nebraska, Nevada, New Hampshire, New Mexico, North Dakota, Oregon, Virginia, West Virginia and Wyoming, plus Washington, D.C. The last spring terminations of Sean O’Leary from Illinois Liquor Control Commission Chief Legal Counsel position without reason has been given already means a lot. This guy simply unable to understand law. DtC (Direct-to-Consumer) shipments are the solely shipments from producers directly to consumers. Retailer does not produce any alcohol. Instead, in most States retailers sell only alcohol that passed through in-state distribution system, so not directly by any definition. The 21st Amendment did not give to the States any power to regulate interstate commerce, period. It was repeated so many times in Supreme Court that justices really tired of it. When Total Wine will enter to Tennessee market, its store will be locked to Tennessee distribution system. This store will be able to sell in Tennessee only products distributed in Tennessee. Shipping from one retail store to another is prohibited by law. Shipping from out-of-state store to consumer will not be permitted at this situation either. Amazon of liquor is not possible while liquor can be sold to consumers only from the stock of licensed retail premises. This business scheme is too complicated and economically infeasible for Amazon like setup. These 13 (11) States allow producers to sell directly to consumers. This practice is nor allowed in general, thus special permit is needed. It is false to believe that these States are anyhow authorized to regulate retail businesses outside of their borders. Alaska does not regulate alcohol on the state level, but shipping is not possible for many different reasons. DC does not regulate how alcohol gets to the district. The conclusion is that Forbes should not publish wrong thoughts of unfortunate lawyer.